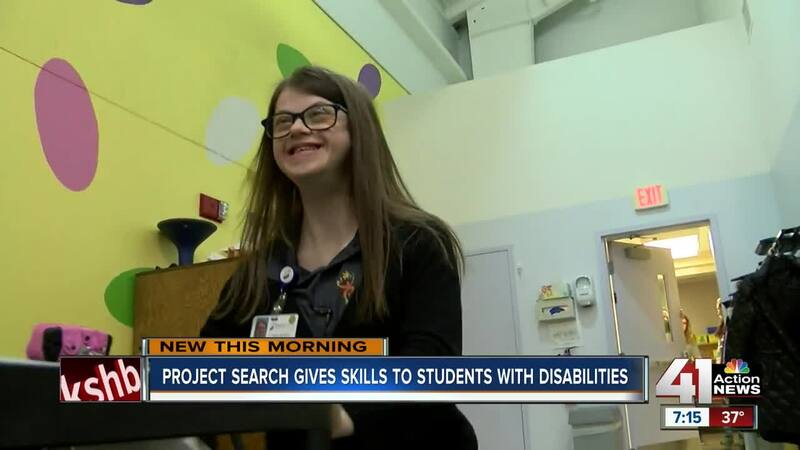 The Shawnee Mission School District and AdventHealth Shawnee Mission are working together to build employment and work training skills for students with special needs through a program called Project SEARCH. SHAWNEE, Kan. — The Shawnee Mission School District and AdventHealth Shawnee Mission are working together to build employment and work training skills for students with special needs through a program called Project SEARCH. There are currently seven Project SEARCH interns with AdventHealth Shawnee Mission, all of whom are recent high school graduates. The school-to-work program provides a variety of training and hands on work skills in different departments within the healthcare field. One of the interns, Lucy Wagner, is a current intern at the Lee Ann Britain Infant Development Center. Students get the opportunity to gain real life-work experience, combined with training to improve student employment skills. The Britain Center serves young children with special needs. “It's been fun to see Lucy, working in our environment, working amongst our staff, our families, our kids,” Milroy said. Wagner helps keep things in order, being a role model for students who come after her in the program and also families who visit the center. “For the parents that when their child grows up and the potential they have as adults, it is so life altering because there is hope in the future by witnessing Lucy in the role,” Milroy said. Project SEARCH helps the students prepare for employment in a variety of settings. Once interns finish the program, they can apply for jobs with another company or AdventHealth Shawnee Mission.